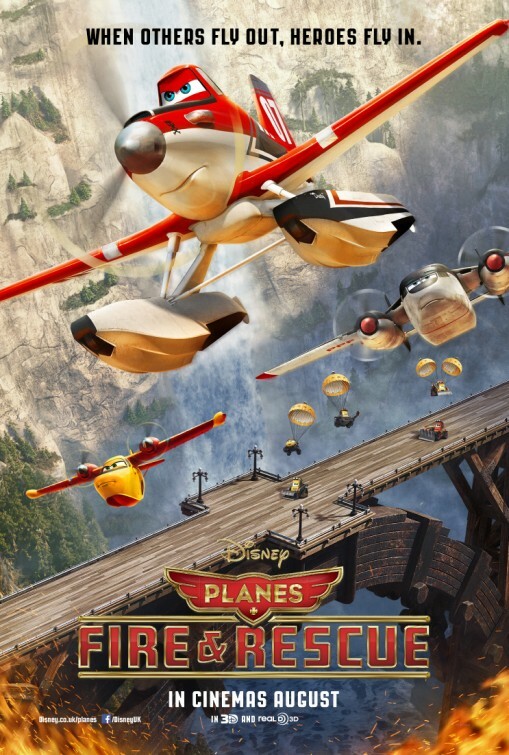 I was surprised and anxious to hear that Planes had earned a sequel. To be honest Cars was a bit of a misfire. Watchable but hardly memorable. I didn’t even get round to watching the sequel. It reeked of desperation when they tried to merge the Cars and Planes universe together. The problems was that Planes felt old fashioned before it even got to start. There was enough silly punnery and charm but it felt oh so flat. Proof that even Pixar can make mistakes. But yet enough money was made to make another and this time . . . Despite being a visual sight to look at (which was to be expected), it pretty much delivers the same old silly wordplay and punnery, cheesy one liners and bland characters but without the charm and gusto that managed to make it scrape by last time. This really is one for the little ‘uns who are interested in planes and cars. Dusty (Dane Cook) is now a renowned racer. However he is hit with the bad news that he can no longer race after his out of production gearbox starts failing. But Prop Wash Junction is in need of a new firefighter cue another re-tread (I mean journey) as Dusty must overcome the odds and prove everyone wrong again. It’s a shame that Cook is having to voice such a dull and unmemorable lead character. You can’t help but feel that they have to keep bringing in crazier and funnier supporting characters to compensate for it. The 3D. What 3D? I could have taken my glasses off and not noticed a difference. Terrible considering the price of a cinema ticket these days, let alone extras for 3D. 2D if you are still intrigued. The new range of characters do their utmost to make this flailing film soar but to no avail. Hal Halbrook delivered an endearing turn to the ageing fire truck May Day. While Julie Bowen (Modern Family) was on voice stealing form as the neurotic Ms. Dipper who is infatuated with our hero. The fact she watches him while he sleeps brought a little chuckle, if a little creepy. Wes Studi (The Last of the Mohicans) pretty much plays a parody of Magua in the form of a helicopter titled Windlifter. The legend that is Ed Harris played a straight faced, stern and predictably bland authority figure. A shame. To be honest, it made me miss the incredibly OTT El Chubacabra. His presence was sorely missed. There was one good skit that parodied the old 70s cop show Chips. However, this time it was Chops. Tut all you like. There was a guilty chuckle. The fact a familiar voice made a cameo return made it all the better but unfortunately it was always going to go over the little ‘uns heads. The fire sequences were interesting and watchable enough but it all seemed by the numbers and a little stale. The odd gag and punnery will get a chuckle from the kids and adults but it all feels like it should have been a straight to DVD film. If not for the Pixar label, I’m sure it would have been. A real shame despite the best efforts of a talented voice cast (that consisted of the likes of Cedric the Entertainer, Teri Hatcher, Patrick Warburton, Brad Garrett) to make their flat characters stand out but one for the scrap heap. Sorry, Pixar. It didn’t work the first time, the second hasn’t improved. I don’t think third time’s the charm this time around.